Does it change? Or does it remain the same? A few years ago, a guy drove up to our house in a pickup with out of state plates. Middle-aged, paunchy, stubbly chin, I’d never seen him before in my life. Sitting in the cab next to him was a teenaged boy wearing a stretched out T-shirt with no sleeves. I walked outside to greet them. Before I could say word, Paunch flipped a card at me through the driver side window. Under his name it said, Lightning Rod Salesman. Lightning rods? I read the card three times. Nobody uses lightning rods anymore. An anachronism, like something out of the early 20th Century. “I don’t think we need any lightning rods today,” I said, handing back the card. The kid ducked down to look at the roof of our house through the truck’s windshield. 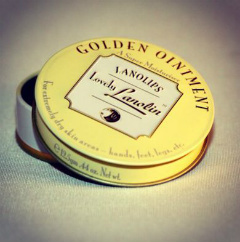 “A man ought to protect his home,” said Paunch. He didn’t actually say that. But the conversation was getting too weird, so I made up an excuse, told him I’d keep the card and keep him in mind, and eventually he drove away. Later that day, I drove past our neighbor’s place. Sure enough, a trio of tall, straight spires with decorative blue bulbs rose from his barn roof, gleaming in the sun. 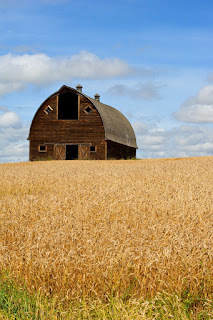 The incident reminded me of the old barn painters that used to frequent Nebraska when I was growing up. Which got me to thinking. What if they were to cross paths? The lightning rod salesman and the painter. Three and a half hours later, weighing in at around 2,800 words, The Better Salesman is the result. Please read The Better Salesman here. Have you ever encountered a traveling salesman of the old fashioned variety? Ever wanted to write about them? Please drop a line in the comment box below. 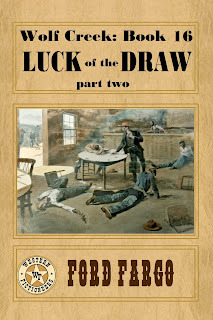 The ground under Mark Kellogg trembled like an earthquake. In the distance, he watched Indian warriors swarm over the horizon at full gallop, their horses thundering across the Great Plains. 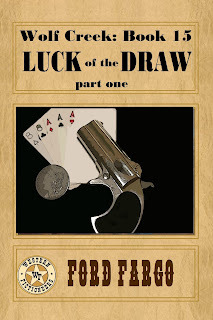 The 45-year old newspaper reporter struggled to stay in the saddle, shocked by the surprise attack, reeling in confusion amid the crack of gunfire and the sound of steel-tipped arrows slicing through the air. In a split-second of clarity, Marcus Henry Kellogg no doubt realized the futility of his situation. Nowhere to turn. No safe place to run. No means of escape. A few minutes earlier, Kellogg had been riding in formation just behind Lt. Col. George Armstrong Custer, flanked by the colonel's two brothers, Tom, and Boston. 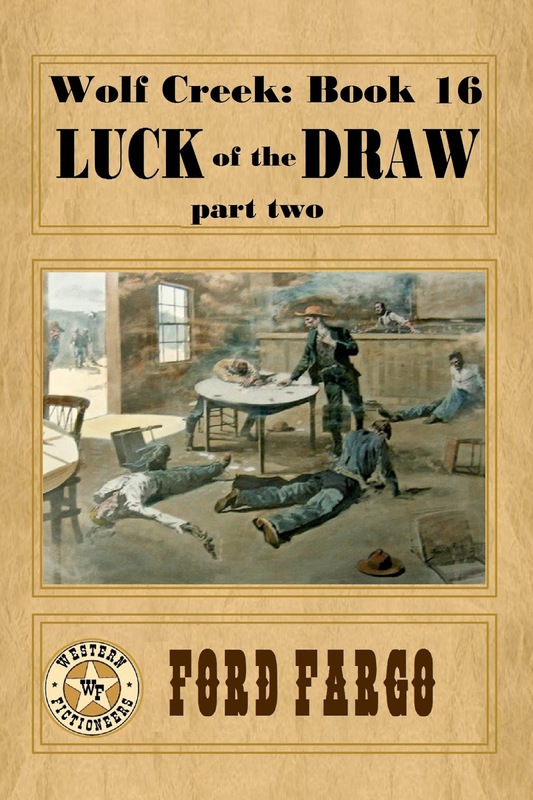 The sudden impact of the attack caused soldiers to break ranks and scatter in panic, seeking shelter on the open Montana Plains of the Little Bighorn. Kellogg, the only reporter to accompany Custer, represented the Bismarck Tribune, New York Herald, and served as a correspondent for the Associated Press. He provided the only press dispatches in the days leading up the epic battle. 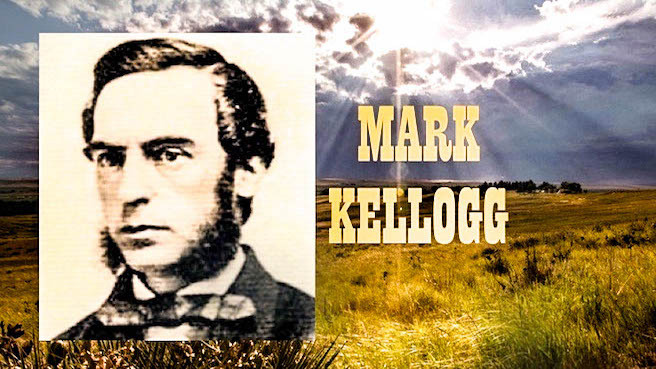 Ironically, it was pure coincidence that Kellogg rode along with the 7th U.S. Cavalry Regiment in June 1876. A Canadian by birth, his family settled in La Crosse, Wisconsin. He worked as an editor and a reporter, traveling throughout the upper Midwest. 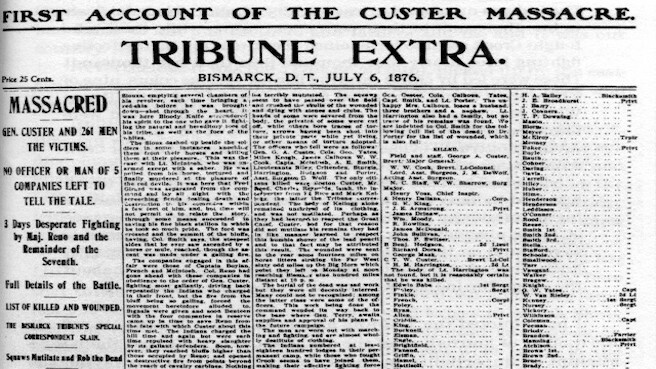 In 1873, he made his way to Bismarck, North Dakota, where he helped editor Clement A. Lounsberry found the Bismarck Tribune. 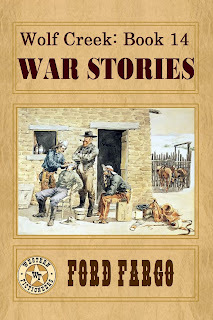 When Lounsberry heard Custer’s 7th Cavalry Regiment was heading into the Montana Territory, he worked out an agreement to ride along and provide news coverage. Before he left, his wife became ill, and he asked Kellogg to take his place. "We leave the Rosebud tomorrow and by the time this reaches you we will have met and fought the red devils with what result remains to be seen. I go with Custer and will be at the death." The term “at the death” was merely a phrase borrowed from a fox-hunting term meaning, "present at the kill." 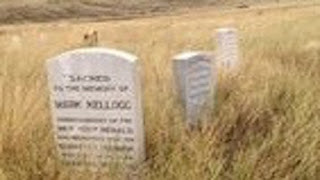 When Col. John Gibbon and his men arrived at the scene of the Custer Massacre the following day, they discovered bodies scattered across the Little Bighorn. While helping bury the dead, Gibbon found Kellogg's body in a ravine, scalped, and an ear was missing. The colonel recovered a blood-stained diary from Kellogg's clothing. 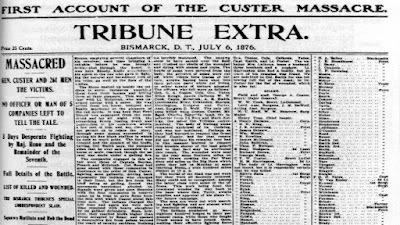 On July 6, 1876, Lounsberry published a special edition of his newspaper with the first full account of the battle. 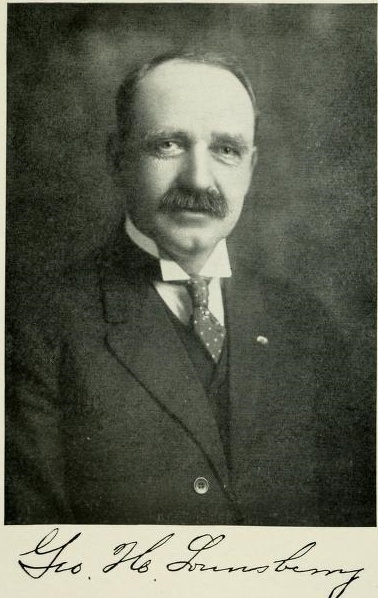 He also telegraphed Kellogg's correspondence to various eastern newspapers, including the New York Herald, which also published, posthumously, two letters Kellogg had written. The Associated Press considers Kellogg the organization's first correspondent to die while covering a military engagement. The North Dakota Heritage Center has Kellogg's diary and notes rescued from the battlefield. A display at the Newseum in Washington, D.C., showcases Kellogg's satchel, pencil, and eyeglasses. Kellogg's notes and news dispatches were among the historical sources of information used to recreate the days leading up to the battle, even though he never got the opportunity to write and telegraph news of a great military victory—or defeat—from the Battle of the Little Bighorn. 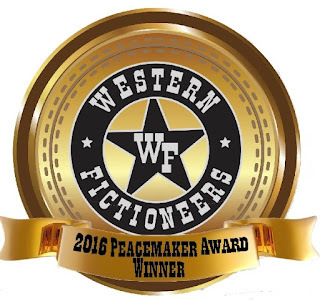 After a brief hiatus, Western Fictioneers' collaborative series is back in a big way. 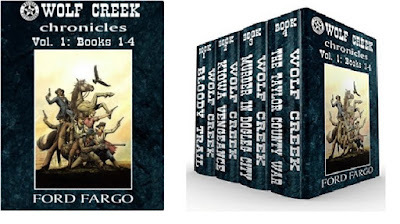 The series is set in the fictional town of Wolf Creek, Kansas in the early 1870s. About two dozen WF members have participated, each creating one (or sometimes two) unique characters who are denizens of the town (or the area.) 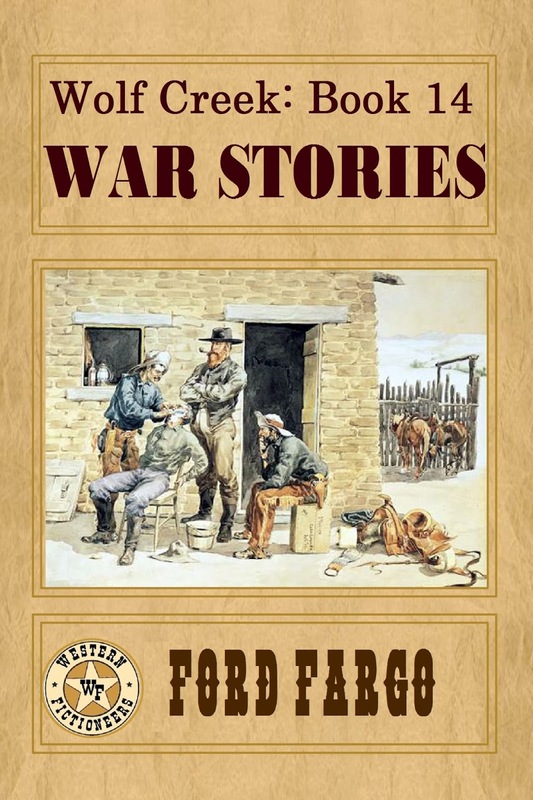 Most books have been novels, with each chapter written by a different author from their character's point-of-view, and others have been short story anthologies (which give the authors an opportunity to delve more deeply into their characters.) The books are released collectively under the house name, FORD FARGO, but the individual authors are also identified. 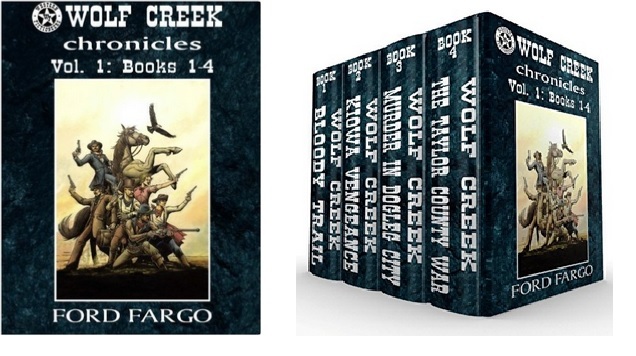 Meanwhile, three brand new Wolf Creek books have recently been released, all themed anthologies. Catch up on Wolf Creek today! 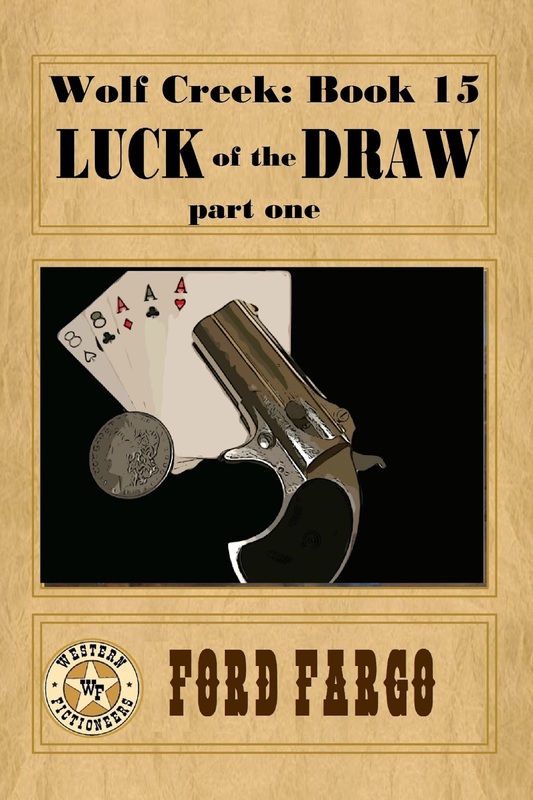 NOTE: a short excerpt -the prologue- from LUCK OF THE DRAW 1 appears at the bottom of this blog. “A poker tournament,” said Dab Henry. Dab was the mayor of Wolf Creek, and owner of the Lucky Break saloon. The meeting was being held in his office. Also present were Virgil Calhoun, owner of the Eldorado, and Ira Breedlove, owner of The Wolf’s Den. Gardner, the town marshal, had been accompanied by G.W. Satterlee, the county sheriff. “Isn’t that sort of what you all have, every day of the week?” Sheriff Satterlee asked. “We have it all figured out,” Dab said, excited. “Well that makes me feel better already,” Sam Gardner whispered to Sheriff Satterlee. “It’ll put Wolf Creek on the map,” Dab said. “Don’t sound like they called us here to ask our permission, or even our opinion, Sam,” Satterlee said. “Making investments,” Ira corrected him. “And the less you do the better, as usual,” Sam said, and G.W. elbowed him. Western Fictioneers would like to thank Awards Chair Robert Vardeman, and the judges for the excellent job they did and the long hours they devoted to the task of endless reading. If ever you find yourself strolling through a picturesque Tennessee field, keep an eye on the ground lest you trip over a Comb. Every region and culture has a habit or two unique to them, largely unknown by the rest of the world. These secluded habits are often forgotten by the passing of our ancestors. However, all is not always lost. Remnants can still be found...if you know where to look. To the west of the Cumberland Plateau, spanning several counties, lies a number of eerie remnants of Tennessee culture. My husband, a born and raised White County, Tennessee native, took his mother and I to explore a few of his ancestral cemeteries. I was not quite prepared for what I saw. 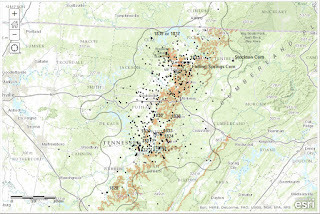 Map of the Tennessee Comb Graves. Comb Graves: Photo by Author, Shayna Matthews. A cedar grove towered over the little cemetery, 100+ year old trees shielding those long-ago laid to rest below. Sunlight filtered through the foliage, casting rays of golden dust upon the graves. And yet, the feeling I had while picking my way around the graves was anything but tranquil. The graves, some of them so old the inscriptions are no longer there, (or perhaps not inscribed at all) look like pup tent shaped vaults. Sandstone slabs at least as long as the grave lean against each other, like an inverted "V". Sometimes they have head-markers, often the identity of the deceased is erased by the passing of time. The old trees seem to remember, for they embrace the strange graves, their trunks growing around the stones, ever so slowly swallowing the tombs. The design of these sandstone crypts were so foreign, so strange, and yet my husband could not comprehend my intrigue. "They're everywhere," he told me. "Aren't they?" No. Most assuredly, no. 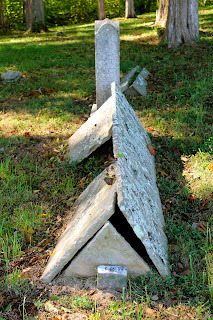 These "tent-graves" are actually called combs, probably named for the peak of a gable-house roof. 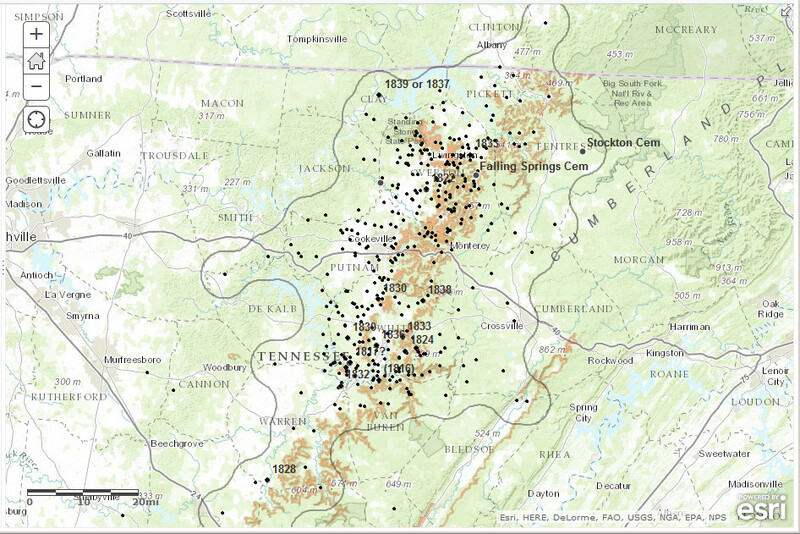 Digging a bit deeper into the realm of the Comb graves, I discovered that the Combs are indeed isolated to a strip of counties which seem to follow the extreme western borders of the Cumberland Plateau. This, of course, leads to the obvious question--why? Why are Combs scattered throughout this one region, and why the strange tent-shaped slabs? One theory is to protect grazing livestock from sinking into the soft-grave earth. Naturally, no one wants their cattle bogged down in a tomb. The Combs do not seem to follow patterns of religious beliefs, as families buried in the same cemetery may have a normal marker vs. a stone tent. The style of Combs also differ throughout the region. While most are sandstone, others may be based on a wooden frame, with stone or metal sheeting. Some "newer" graves from the early 1900s are even erected from metal roofing. A smattering of Combs can also be found in Kentucky, Alabama, and Arkansas. Interestingly, the rarest Comb recorded, made of marble, sits in Texas. The inscription reads NANCY YEATS, Born Feb. 19, 1831 - Died Feb. 19, 1910. Although Nancy Yeats expired in Texas, she rests in one of the most elegant forms of Comb graves in the books. Oh, did I mention, Nancy was a native of Tennessee? Tradition, it seems, sometimes carries on even through death. Contrasting the Tennessee Valley Combs, a walk through my own native land and its cemeteries will show you a much different form of heritage carved in stone. Lancaster County, Pennsylvania is home to a plethora of rich Penna-Dutch folklore and traditions. My favorite? The hex sign. Pennsylvania Dutch consists of a group of people who are descendants from German immigrants. 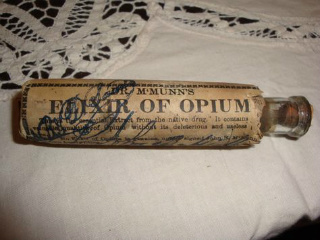 They arrived sometime before the 1800's and settled in the pristine farmlands of southeastern Pennsylvania. Confusing as it sounds, this group is not Dutch, but German. "Deutsch" is the German word for, well, "German". This is also where our English word "Dutch" derived. 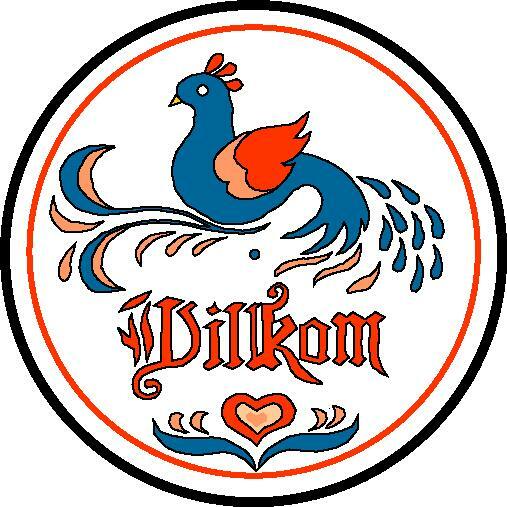 The Pennsylvania Deutsch carried with them a flair for artistic folklore. Their belief in Hex Signs--those colorful and intricately painted designs, began showing up on the barns they built. Now, if you know German, you know that "hex" means "witch". It is often said that the original belief in the hex signs is that they are painted at the top of a barn--the farmer's livelihood--to ward off evil spirits and witches. Others say the signs are merely for decoration. 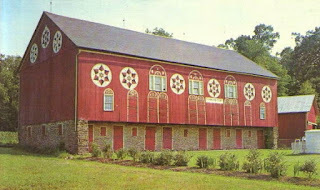 Pennsylvania Deutsch Barn decorated with Hex Signs. Tulips and hearts are popular designs. unite the body with the soul and bring together the "brotherhood"
with our chorus of children in that great year of Jubilee. for you too must die." This morbid gravestone sits, dark and foreboding, among the pleasantly carved arches with intricate flowers, moons and stars, birds and hearts so colored throughout the culture. Most stone markers, perhaps unimpressive in shape compared to the Combs, were (and still are) engraved with the telltale art of the hex sign. In contrast to Momento Mori, weeping flowers, distlefinks (birds modeled after a goldfinch which bring good luck in the culture), and a number of various designs can be found carved in stone; forever granting wishes of love, prayer and good luck to the beloved resting below. The next time you are passing by a secluded cemetery, perhaps you will take the time to stop and look around. What remnants of isolated traditions will you find carved in stone within your own region? --By Shayna Matthews, Author of "The Legend of Venture Canyon" and "A Spot in the Woods", a non-fiction short within the "Memories From Maple Street, U.S.A. Leaving Childhood Behind" anthology. The Memento Mori Grave in Lancaster, PA.
Skull, hourglass & sickle rarity. Two more examples of PA German gravestones. These graves are neighbors to the Memento Mori stone. After a hard day on the trail, your cowboy's going to have sore muscles, and he might have a headache Sunday morning after a night on the town. 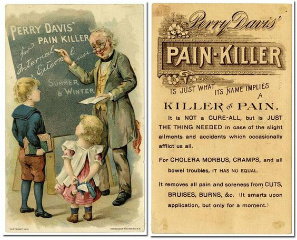 Here are some typical pain remedies your characters might have tried. When possible, I've included the ingredients, prices, and any advertisements I found. 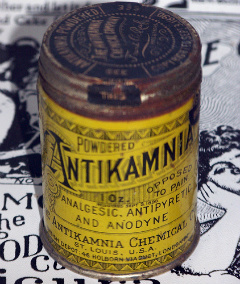 I've also included approximate dates for the brands, so you can figure out if it would have been on the druggist's shelves when your characters were looking.